The Nyingma Gyübum (Tib. རྙིང་མ་རྒྱུད་འབུམ་, Wyl. rnying ma rgyud ’bum) is a collection of Nyingma tantras. 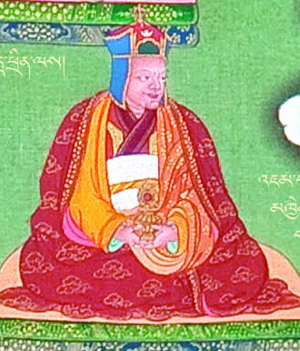 It was first compiled by the great tertön Ratna Lingpa after similar compilations of texts made in the 14th century, such as the Kangyur and the Tengyur, had omitted many of the Nyingma tantras. It was first published towards the end of the 18th century under the guidance of the Omniscient Jikmé Lingpa, in Dergé, thanks to the patronage of the regent queen of Dergé Tsewang Lhamo. Today the collection exists in various editions, which differ slightly in their content and in the way they are organized, although they share a core set of texts, and are all organized according to the three categories of Mahayoga, Anuyoga and Atiyoga. The collection includes both termas and kama texts. Bai ro'i rgyud 'bum compiled and translated by the eighth century Tibetan master Vairotsana. Reproduced from the rare manuscript belonging to Tokden Rinpoche of Gangon by Tashi Y. Tashigangpa. The 8 volume Bairo Gyubum is a collection of Nyingmapa tantra material found among the nomads of northern Ladakh. The lineage of transmission of these teachings has disappeared. sDe dge Edition First published under the direction of Jikme Lingpa and the patronage of the queen of Derge at the end of the 18th century. 26 vol. gTing skyes Edition and Dilgo Khyentse Rinpoche Edition (1974, New Delhi;1975, Thimpu). The later was reproduced from the manuscripts preserved at Tingkye monastery in Tibet under the direction of Dilgo Khyentsé Rinpoche. 36 vol. Cathy Cantwell, “Distinctive features of the Rig ‘dzin tshe dbang nor bu (Waddell) Edition of the rNying ma’i rgyud ‘bum”, in Helmut Eimer & David Germano, The Many Canons of Tibetan Buddhism, Brill’s Tibetan Studies Library, vol. 2, p. 359-376. Franz-Karl Ehrhard, 'Recently discovered manuscripts of the rNying ma rgyud 'bum from Nepal'. In H. Krasser, M. Torsten Much, E. Steinkellner, H. Tauscher, Tibetan Studies: Proceedings of the 7th Seminar of the International Association for Tibetan Studies, Graz 1995, Volume I: 253-267. Tulku Thondup, Hidden Teachings of Tibet (Boston: Wisdom, reprint edition 1997), 'Appendix 3: Categories of Texts in The Collection of the Ancient Tantras'. Achard, Jean-Luc “La liste des Tantras du rNying ma’i rgyud ‘bum selon l’édition établie par Kun mkhyen ‘Jigs med gling pa”, Revue d’Etudes Tibétaines, no. 1, Paris, CNRS, 2002, p. 62-89. Achard, Jean-Luc, "Rig ‘dzin Tshe dbang mchog grub (1761-1829) et la constitution du rNying ma’i rgyud ‘bum de sDe dge”, Revue d'études tibétaines, n° 3 : 43-89.